Most people are familiar with the main classes of cruise ship cabin: Inside, oceanview, balcony and suite. 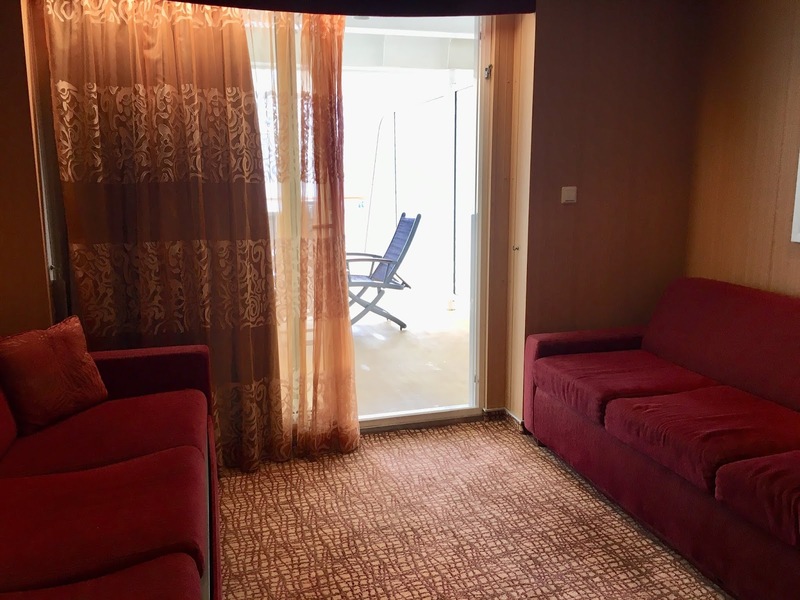 But there is a classification of stateroom that is less common, and that is the cabin that falls somewhere between the balcony room and the suite. Shown above is a photo of the bedroom, with a queen bed, desk and chair, and TV. The closet is left; a standard bathroom is right. The glass-paned door just beyond the bed slides all the way shut, offering privacy whenever required. There is some cupboard space under the TV, as well as a bar fridge. There is a safe in the closet. This is the sitting room with two couches that convert into beds. Not visible in this photo is a chest of drawers with lots of space, plus a second TV. The couch on the left flips over, cushions and all, into a single bed that is already made up with sheets and a pillow. The couch on the right folds out into a double bed. So technically, you could fit three more in this room. However, if the couch on the right were folded out into a bed, it would take up all of the space between the two couches, and there would be no place to walk. This is the gigantic aft deck, big enough for a table and four chairs PLUS two chaise loungers. Another look at the veranda, which is a whopping 240 or so square feet. (If you're lucky enough to book one of the corner verandas, they're even bigger.) 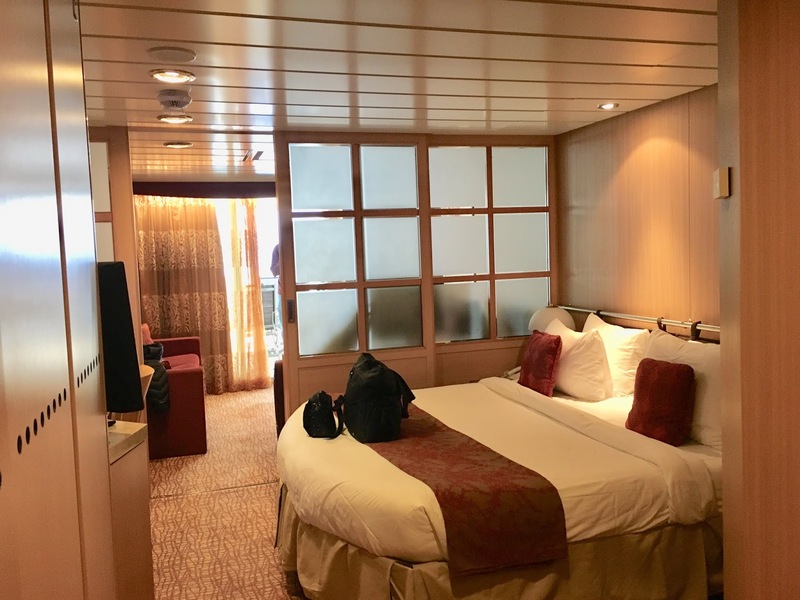 Combined with the 270 square feet in the stateroom itself, this is a lot of room. A word of caution, though: Being aft, you'll definitely feel the motion of the ship. Otherwise, I loved staying in this room. You probably know at least one person who takes photos of his or her food. Every meal. I'm that person. And not only do I take photos of my food, I will also take photos of menus if I want to remember them. I did just that during a recent family cruise to Alaska. 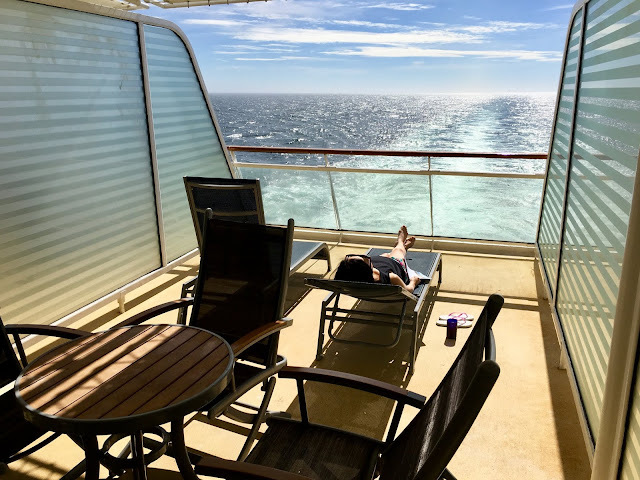 It was our family's first cruise and frankly, our minds were totally blown by the amount of food and the calibre of the meals we were served. If you've never cruised, or if you've never cruised Celebrity -- which won five of the top 10 spots in Cruise Critic's list of Best Cruise Ships for Dining 2018 -- here are seven nights of main dining room menus from our Alaska cruise on the Infinity. The offerings within the dotted boxes on the menu are the Celebrity classics offered every night; the rest of the menu changed daily. It was all incredibly delicious, all the more remarkable considering the volume of meals being served on our ship. 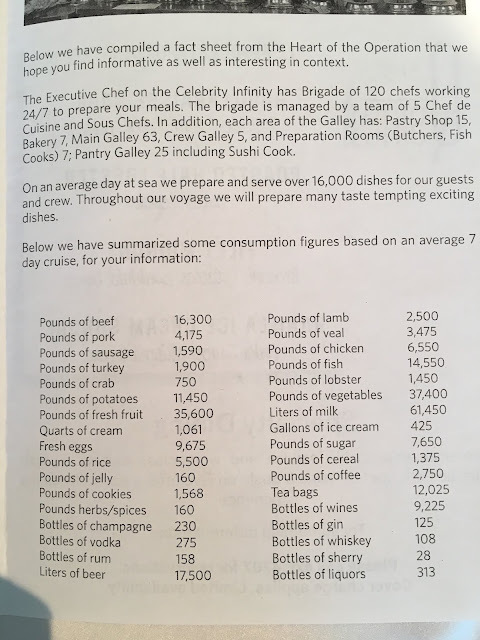 Read to the end to see a fact sheet detailing the amounts of food served on every seven-night cruise. 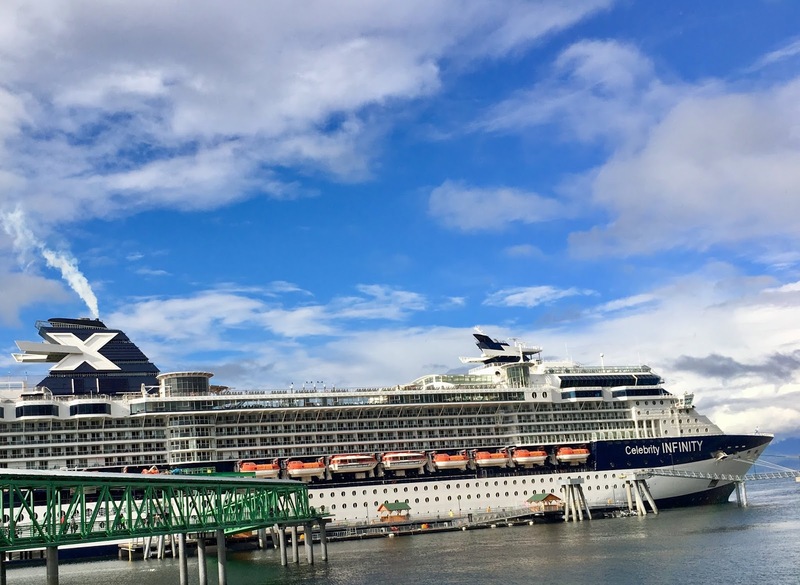 We loved our Alaska cruise so much we've booked a Mexico cruise, this one on Princess. I'm anxious to compare menus between the two lines. Grrr ... 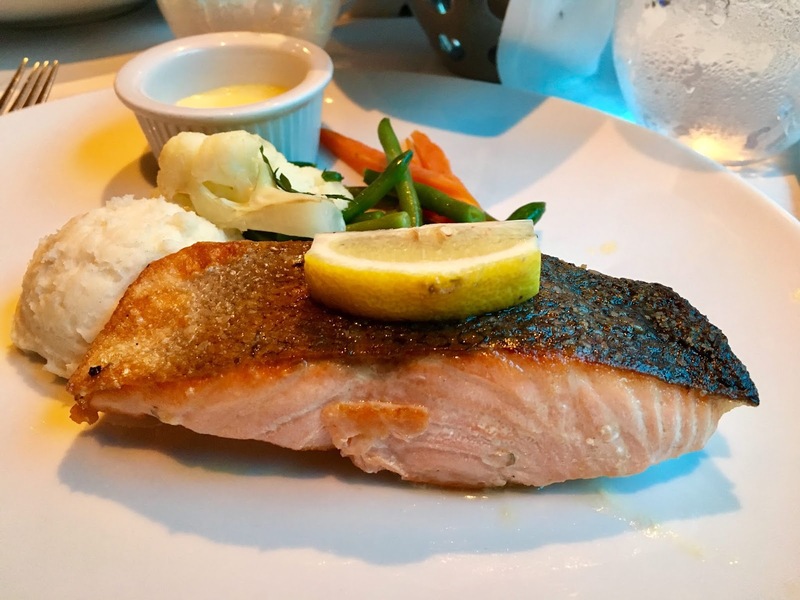 The blue tint on the windows turned all of my photos blue, including this one of seared salmon. 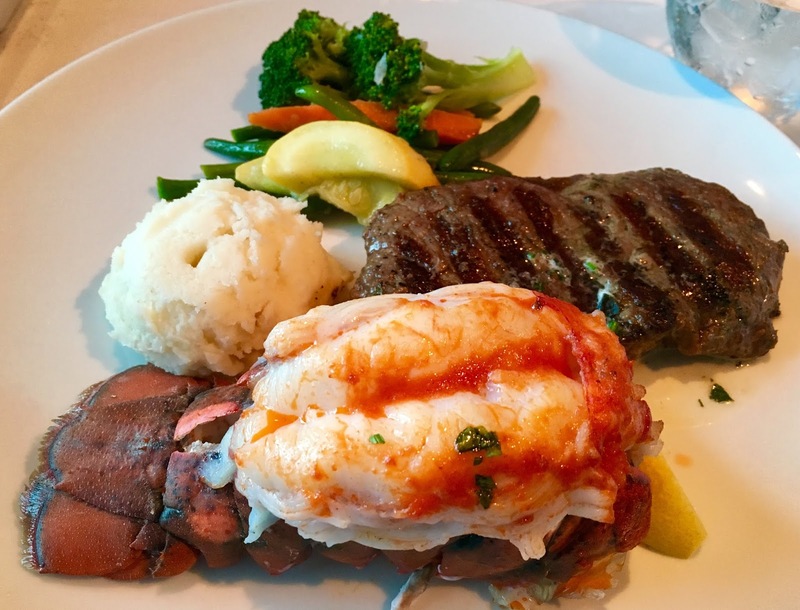 Broiled lobster tail and steak. 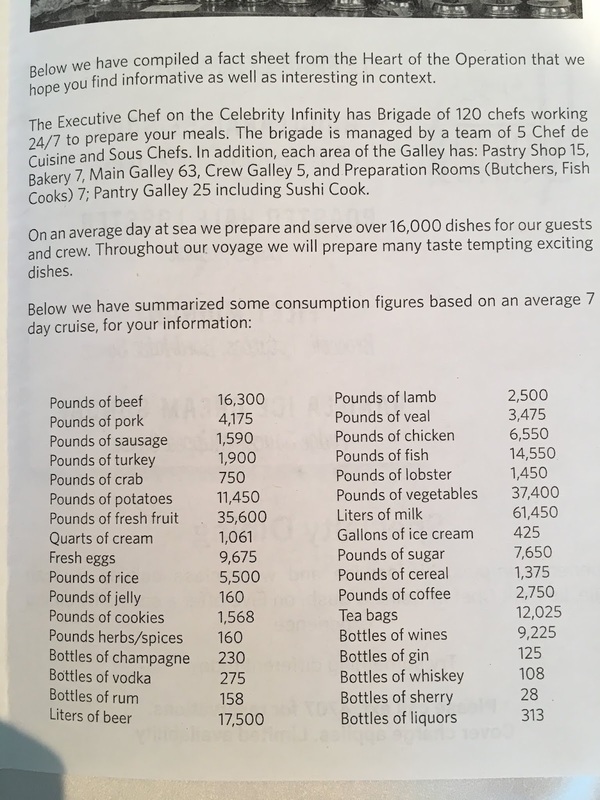 The food and drink served on an average seven-night cruise on our ship, the Celebrity Infinity. Although any list of the best things to do in any city is by nature subjective, there are always some universal must-sees. My list of the top 10 things to do in New Orleans is a hybrid of the two, a collection of sights that will satisfy both mainstream and niche interests. 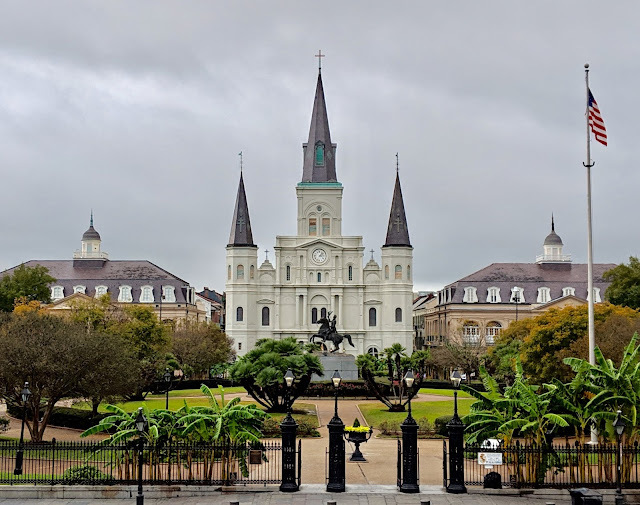 Prices range from free (Jackson Square) to not cheap (city bus tour). 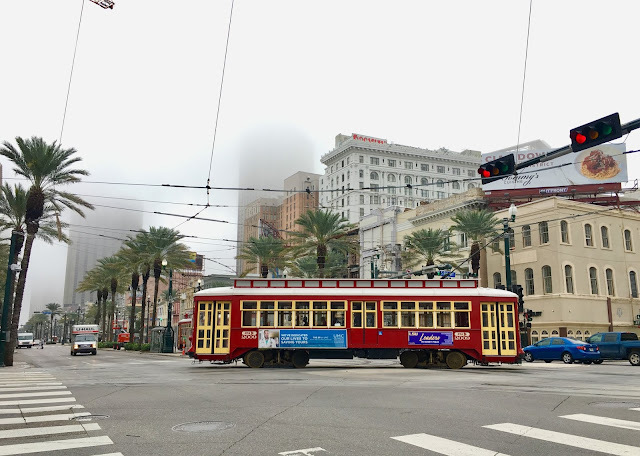 New Orleans is one of the best walking cities in the world, so if you're staying near the French Quarter, or even a little farther away, you'll find it's easy to walk everywhere. Laissez les bon temps rouler! If ever there was a city that shouted "Instagram," New Orleans is it. And within this city, your most iconic shots will come from the French Quarter, with its ornate 18th-century buildings and ironwork balconies. 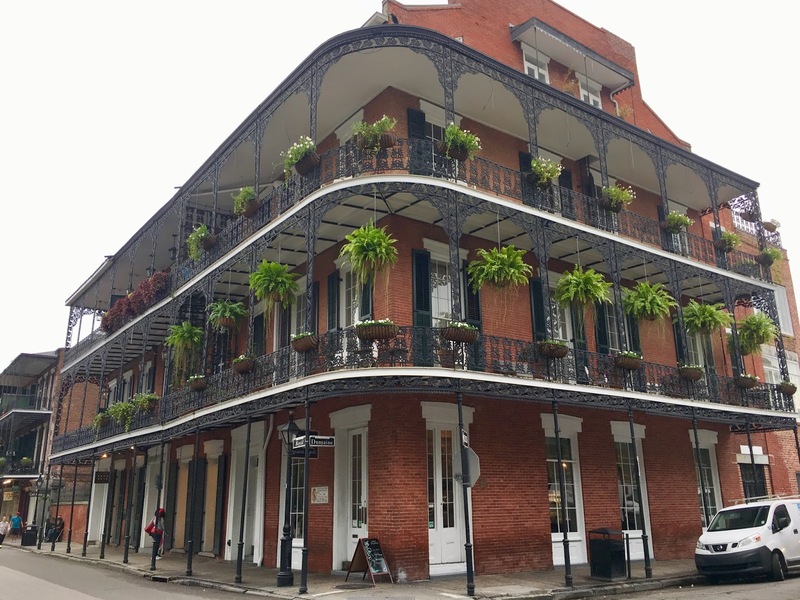 This oldest part of New Orleans is also the city's most famous attraction. Royal Street at Dumaine in the French Quarter. Stroll along the Quarter's 80 or so square blocks and you'll find something for everyone: Restaurants and bars (a lot of them! ), boutiques and souvenir shops for shoppers, and live music all over. Night-time bar scene on Bourbon Street in November. 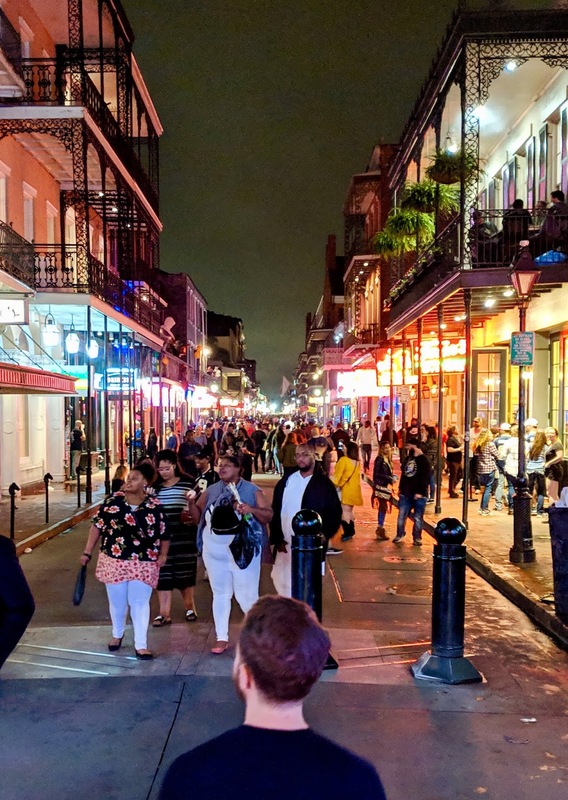 Bourbon Street is the heart of the French Quarter and it's pretty much the only street that's open for business after dark. It's slightly run-down by day, and can be more than a little seedy by night -- but it's all part of the area's character. No need to worry, though: There's always a strong police presence, with plenty of officers on horseback keeping an eye on revellers. Diners at a restaurant on Bourbon Street get a surprise visitor during their meal. A trio of beignets costs $2.73 plus tax. After the French Quarter and Bourbon Street, having a beignet at this NOLA institution is probably No. 1 on many tourists' lists. 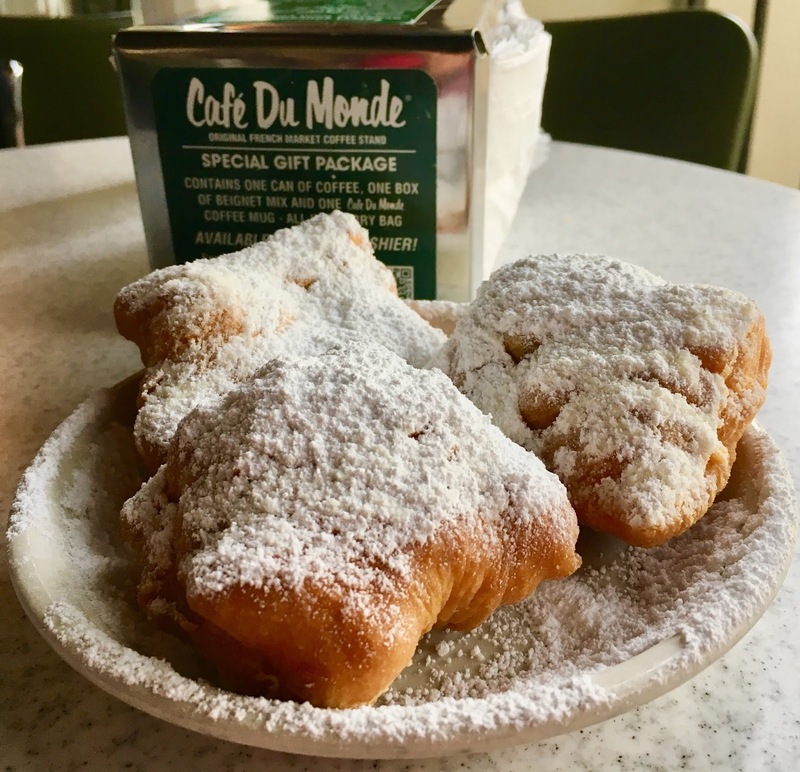 What you might not know is that Cafe du Monde's only food item is the beignet (except for coffees), and they're so good the restaurant has been serving them for 150+ years and in fact is now a chain. The French Market location in the French Quarter is the original location. 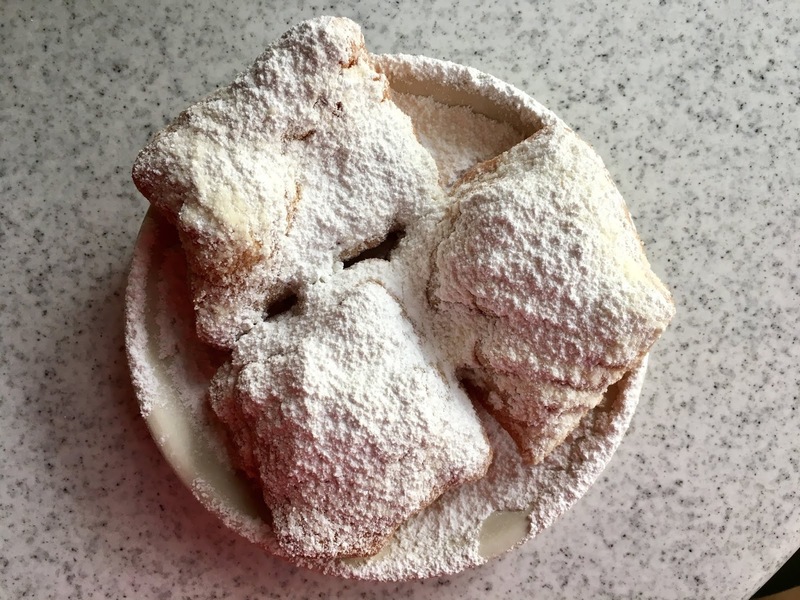 A trio of beignets will cost about $3; order at the window and a server will bring your beignets to you. The original Cafe du Monde, the French Market location. There's some great music coming out of the Spotted Cat. 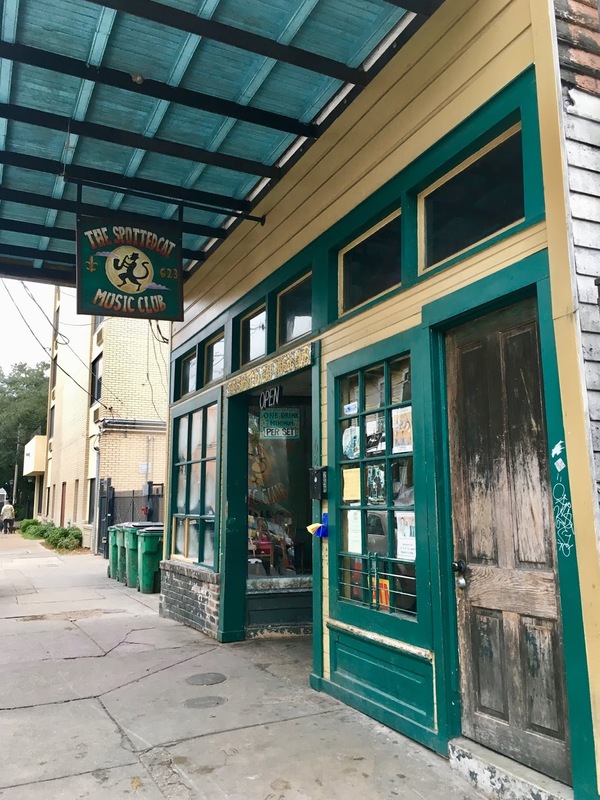 If the raucous rowdiness of Bourbon Street is too much for you, head to Frenchmen Street; it's at the northern border of the French Quarter and it's where the locals go to escape from tourists. 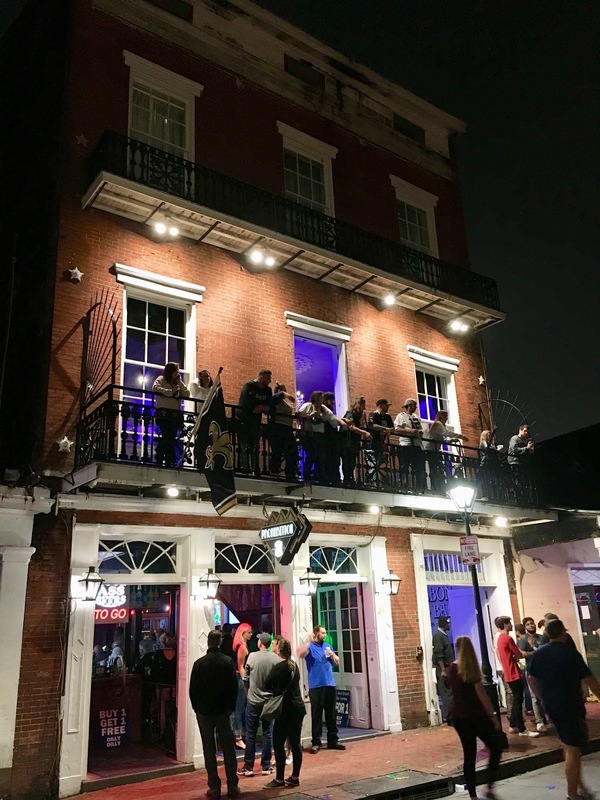 The jazzy part of Frenchmen Street isn't all that long -- just a couple of blocks -- but its restaurants and live music venues come to life after dark. If you're there during the daytime, you can find live jazz at the Spotted Cat. Jackson Square, with St. Louis Cathedral as its centrepiece. The Mississippi River is directly behind me. This historic landmark is one of the best places to spend an afternoon people-watching and window-shopping. You'll find face-painters, magicians, jugglers and street performers of all kinds here, most of them working for tips. There are a myriad of shops for browsing. The New Orleans waterfront on the mighty Mississippi is a great spot to take a stroll; it's also the spot where many river and land tours start. 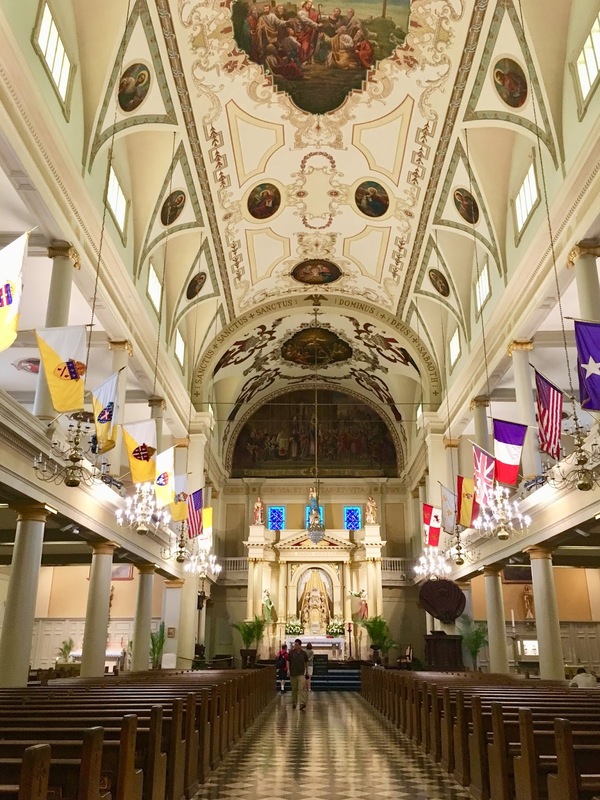 And don't forget to check out the majestic St. Louis Cathedral, the oldest in North America. It's open free of charge to the public for viewing and for those who want to take part in a Catholic mass. The interior of St. Louis Cathedral. I've heard of tourists who check the wedding and obituary sections of newspapers, hoping to find announcements of second line parades. "If it's in the paper, it's practically an invitation to join in," one person declared on Facebook. I wasn't sure if this was true, but I was prepared to do the very same thing because I wanted to see one. Thankfully, it didn't come to that; we saw a wedding second line parade right before us just as our Uber dropped us off at our hotel. It's totally a fluke thing, but do try to see a second line parade if you can; it's such a New Orleans tradition. 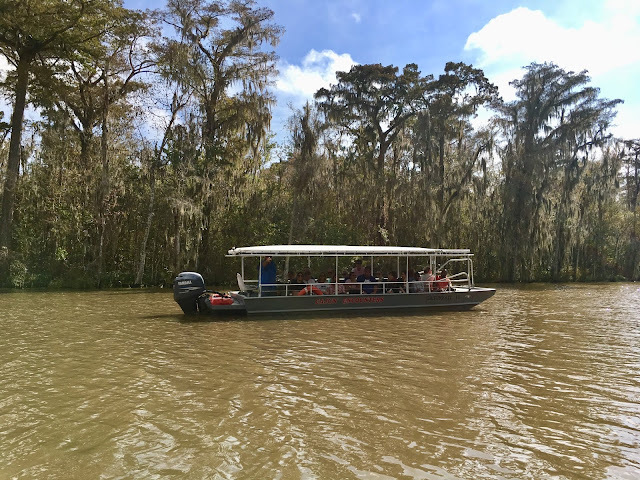 The Cajun Encounters Honey Island Swamp tour. The swamp tour is one of those New Orleans "musts," in my opinion. 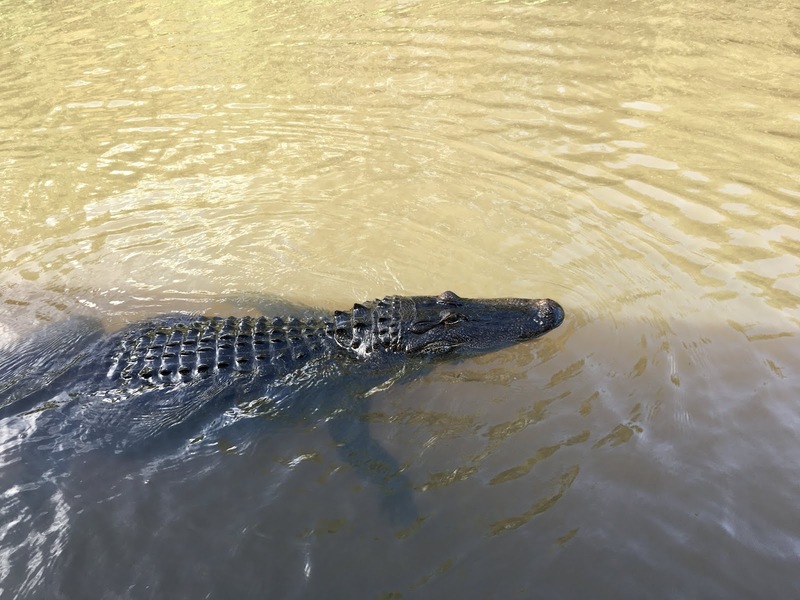 Here's where you can see gators and raccoons and hogs and all kinds of avian life. If you're from Canada, as I am, you'll be seeing a lot of these creatures for the first time. If you're lucky, you'll get an awesome guide like we did, a man who appeared to be of retirement age, but who has a passion for the land and a ton of information to impart. Our hotel recommended the Cajun Encounters swamp tour, and this company has my huge thumbs-up also. The tour company offers pickup and drop-off to and from various downtown hotels. There are gators everywhere. Guides lure them to the boat using bits of wieners on long sticks. 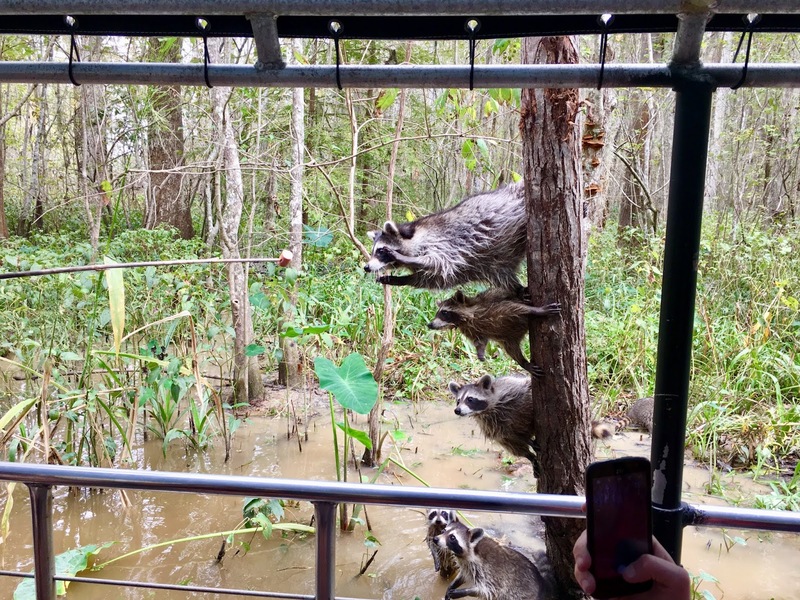 I didn't expect to see so many raccoons. They're all well fed, eating the wieners served up by tour guides! The front of the "Big House" at the Whitney Plantation. If you're going to do a plantation tour -- and this is another "must," in my opinion -- I highly recommend visiting the Whitney Plantation. 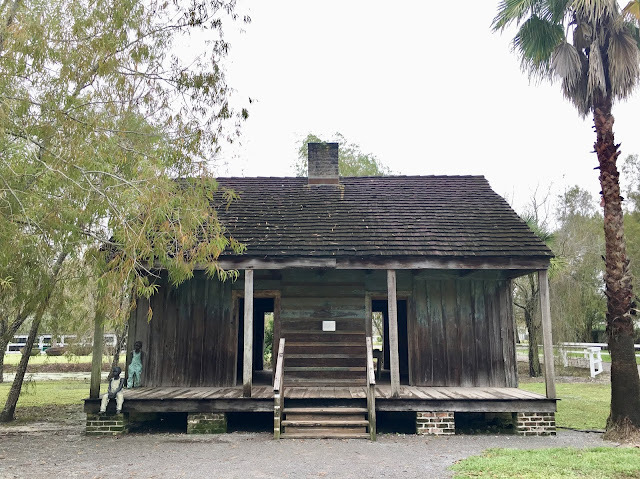 It opened in 2014 and is the only plantation in Louisiana that's told from the viewpoint of the slaves, and what you'll see and learn is both eye-opening and heartbreaking. The owner of the Whitney bought the plantation some years ago with a plan to flip it and make some money, according to our guide. But then the owner found a box of slave documents in one of the buildings, and knew this history had to be preserved. He then spent millions of his own money converting the plantation so that it could be opened to the public, to ensure this history would never be forgotten. Even more cool, the owner is still alive and can sometimes be seen wandering around the grounds. You'll need a car to get to the Whitney, and Uber doesn't come here. Do as we did: Rent a car for the day, take a trip to Baton Rouge (see No. 10), and stop in at the Whitney en route. Reservations are recommended so you don't get sold out. Also, cover up and have your mosquito repellent ready ... the skeeters here are big enough to pick you up and carry away. This structure is two homes. Anywhere from three to 10 slaves lived on each side; they may or may not have been related. Our bus tour stopped at one of the above-ground cemeteries in New Orleans. If all you want is a taste of the city, a bus tour is the best way to get a good sampling. Our Gray Lines bus tour was good, though not cheap at $44 USD per person. 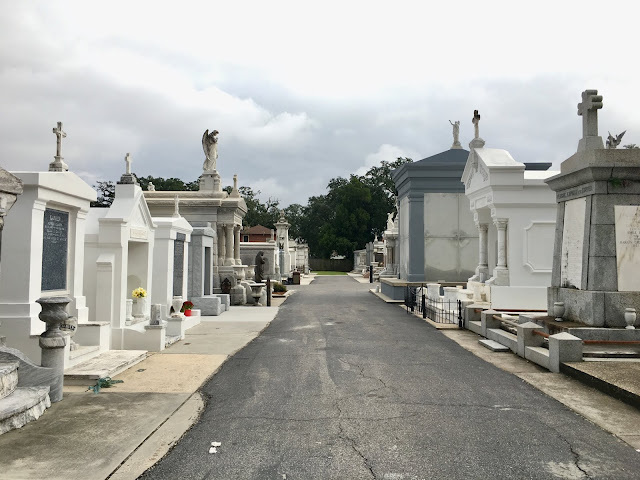 But we learned a lot of interesting history, stopped at an above-ground cemetery, visited the awesome City Park and saw some cool neighbourhoods including the posh Garden District and the historic Faubourg Marigny area. If we'd had more time, we would have visited some of these areas on our own after we did the bus tour. 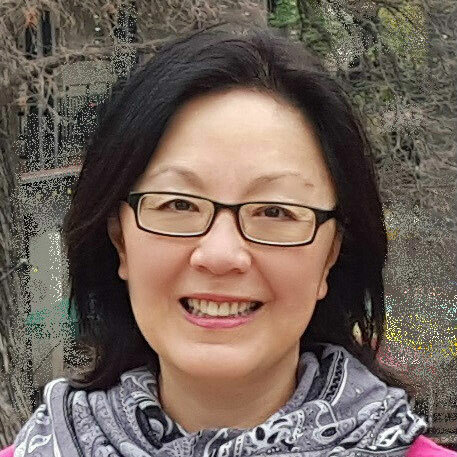 Budget travel: If money is tight, consider taking a streetcar tour of the city. 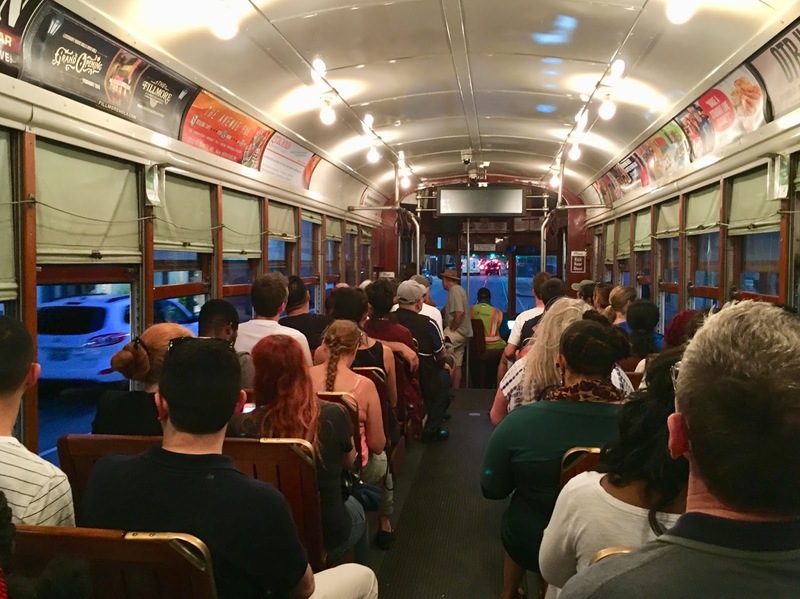 The St. Charles trolley line in particular will take you on a tour of the lovely homes of the Garden District, and it will only cost $1.25. Also, it's just really fun riding the streetcar with the locals. The original streetcars of the city now run alongside cars on the streets. The streetcars are a great, cheap way to see NOLA. It'll cost you $1.25 to ride the trolley, though there are also longer, multi-use passes for purchase. New Orleans is a huge sports town so there are a ton of choices if you're so inclined. 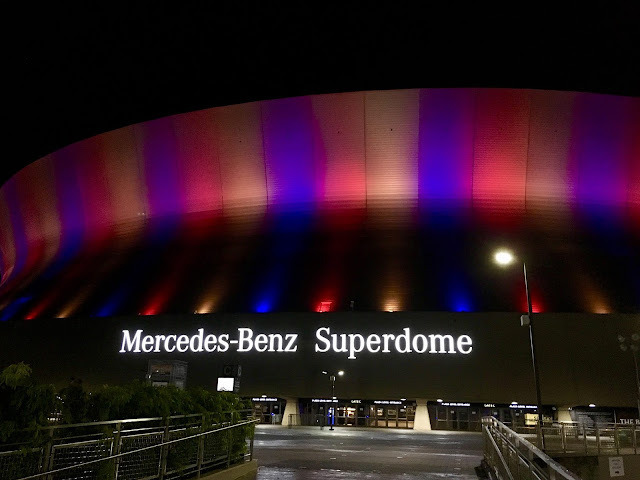 We went to an NFL game (Rams vs Saints) at the Mercedes-Benz Superdome (capacity about 75,000) and an NBA game (Bulls vs Pelicans) at Smoothie King Center (capacity about 18,000). Both were huge fun. I'm not a sports fan but, oddly, I do love going to sports events, oohing at the venue, eating my hot dog and nachos and, in this case, fist-bumping with strangers and proclaiming "Who dat!" Even for a non-sporty person like me, the Superdome is truly a sight to see. I especially liked the steep pitch of the stadium, so that even if your seat is quite high up, your viewing angle is still excellent. The truly cool Mercedes-Benz Superdome. Note the fantastic roof. The National WWII Museum comprises five buildings. 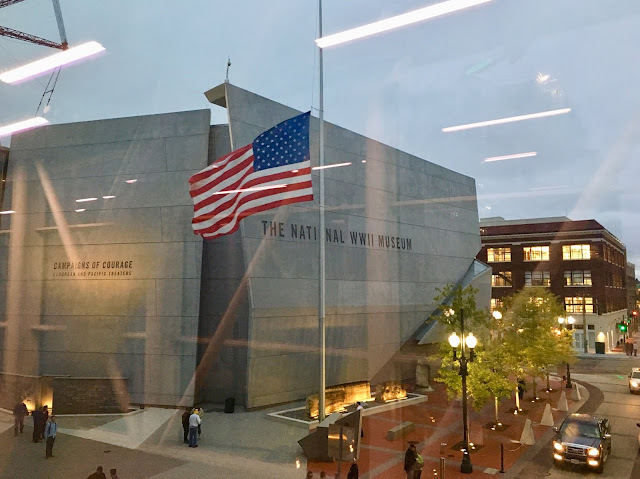 The National WWII Museum is one of those sights that all of the fellow tourists we spoke to in New Orleans said we had to see. Still, we weren't convinced, and we left it until our last day as one of those things we'd visit if we had time. Wow, what a mistake to not have moved this to the top of our list! The historical exhibits, the films, the first-person accounts, the artifacts, the 4D movie narrated by Tom Hanks are so poignant and compelling even if you don't personally know anyone who's been through the Second World War. Those young boys who fought for our freedom were so courageous, and it's horrifying to imagine how scared they must have been, and the atrocities they endured. We spent four hours in the five buildings of the museum and only left because it was about to close. We felt a bit squeezed for time at the end as we rushed to see everything before it closed. Give yourself time to see this properly. One of the many compelling exhibits of the National WWII Museum. 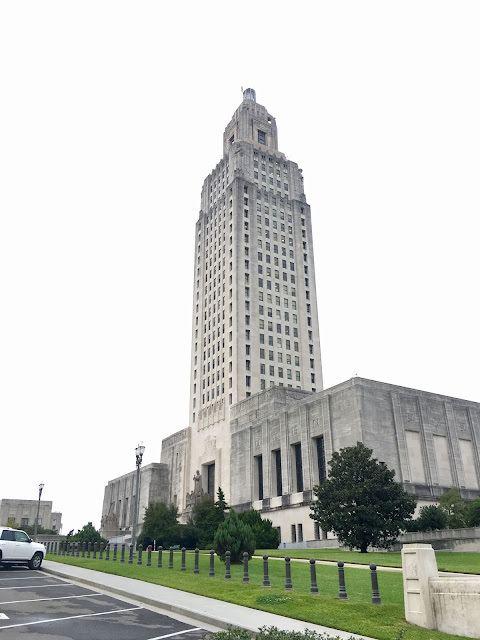 The Louisiana State Capitol, which has a 360-degree observation deck on the 27th floor. I don't think a trip to the Big Easy is complete without a visit to Baton Rouge, especially when it's so close to New Orleans. 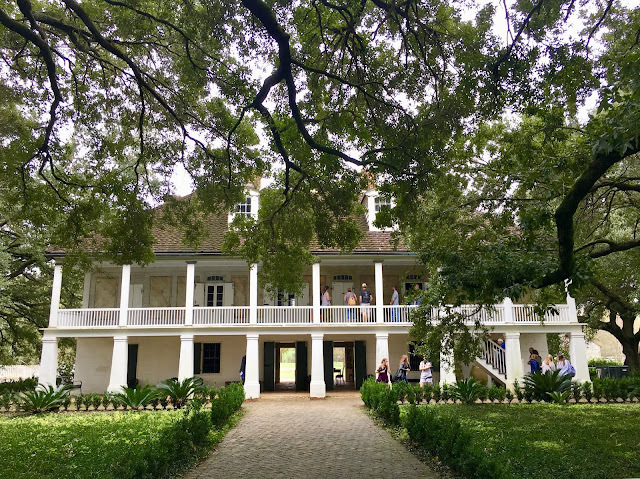 Baton Rouge, the Louisiana capital, is only a 75-minute drive east, and it's a great day trip. We combo-ed our visit with a stop at the Whitney Plantation (see No. 6) and it was a perfect itinerary. 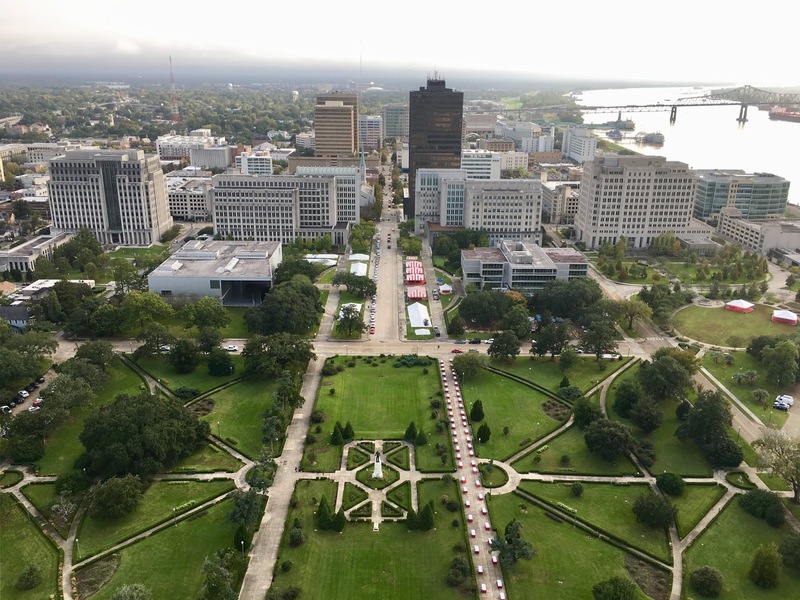 In Baton Rouge, visit the Louisiana State Capitol and visit its 27th-floor observation deck (free!). We also enjoyed driving through the stately and sumptuous grounds of Louisiana State University, and the city's Riverfront is a beautiful way to while away some time. We ended our day with a fabulous meal at Roux 61. View of the Louisiana State Capitol grounds in Baton Rouge from the 27th-floor observation deck. I always love it when our hotel has a bit of history behind it. In fact, when possible, this is how I choose where my husband and I stay when we're travelling. 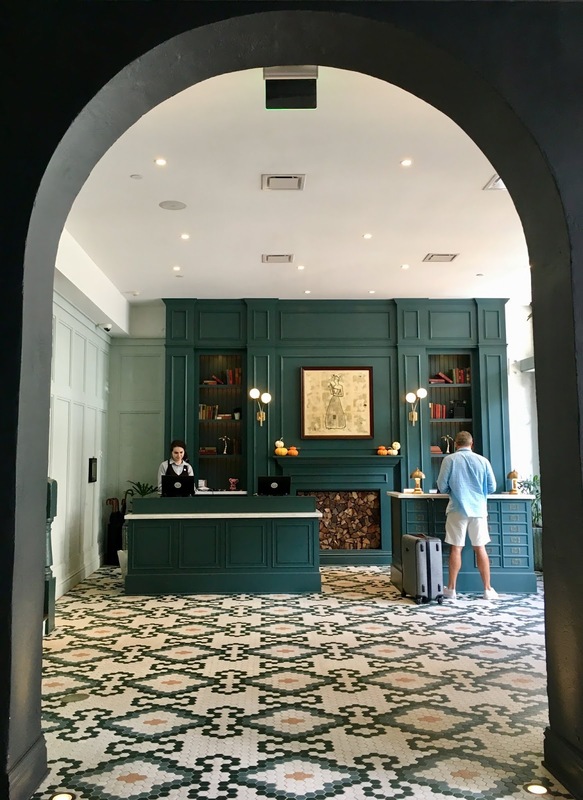 The new Eliza Jane hotel in New Orleans met this criterion and so much more, and I wanted to share some photos from our recent visit. I'm a newspaper editor in my day job and so I've have always been fascinated by all things print. 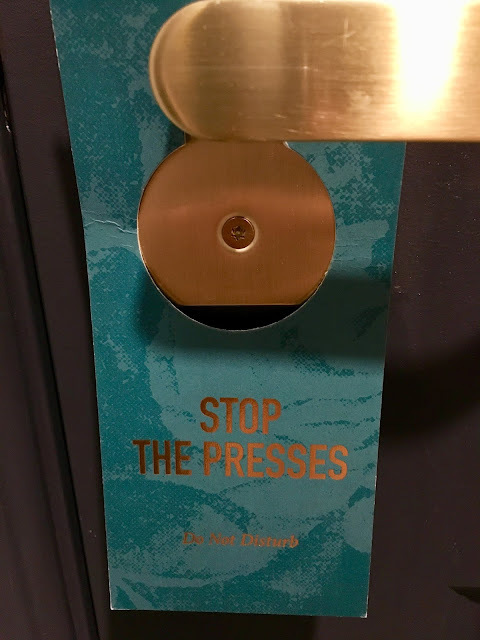 This made our stay at the Eliza Jane all the more relevant for me. 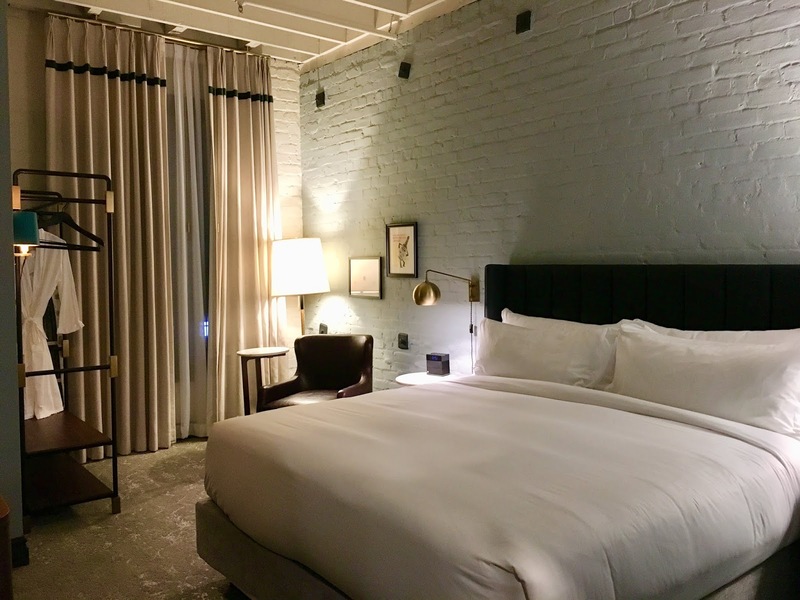 This boutique hotel, which is part of the Unbound Collection by Hyatt, is located in the one-time offices of the storied, Pulitzer Prize-winning Times-Picayune newspaper. It is named for Eliza Jane Nicholson, the newspaper's former publisher and the first woman to head a major, daily newspaper in the U.S. Already super-cool, right? 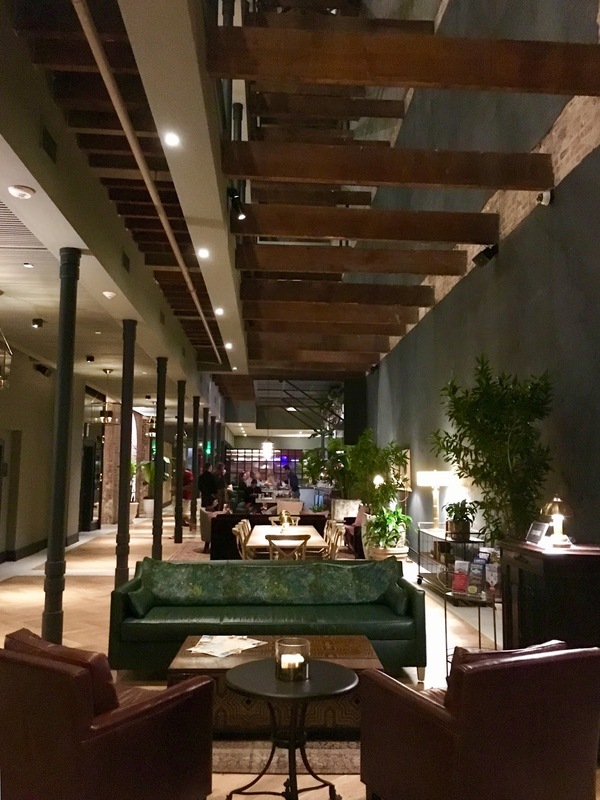 I learned from our concierge that the long and skinny physical spaces of six businesses were actually required to house the Eliza Jane, with the Times-Picayune building being one of the six and Peychaud's Bitters being another. There are nods throughout the hotel to the buildings' past. Aside from the fantastic history here, we loved the Eliza Jane and were so happy this was our home for seven nights. 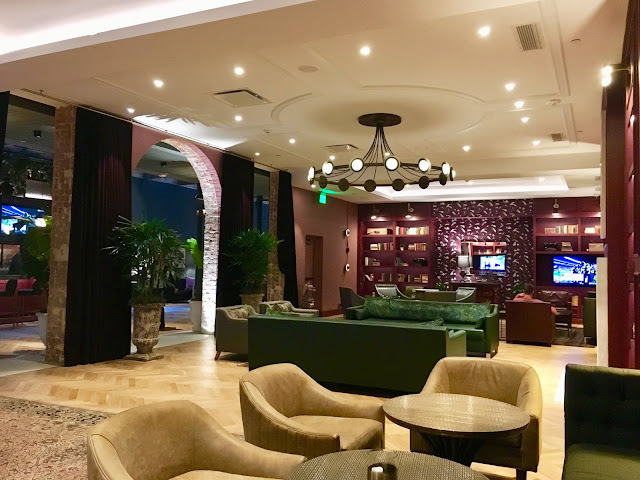 Our standard room was spacious and comfortable, the staff was so great, and we loved having a bar and library lounge where we could relax by the fire in the evenings. (Because New Orleans can be damn chilly in November!) 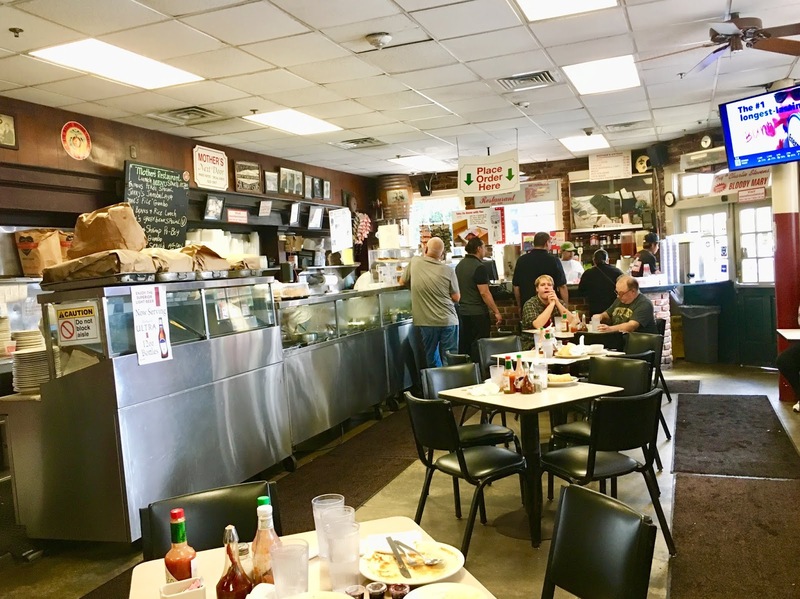 We were surrounded by delicious food, not the least of which was the Ruby Slipper Cafe right across the street, so handy for breakfasts, and the incredible Mother's Restaurant right around the corner. And, location location location! We were within walking distance of everything, and that is not an exaggeration. 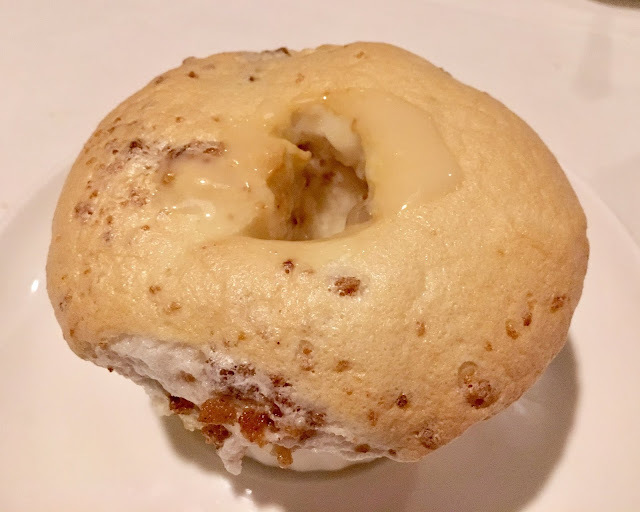 The Eliza Jane is blocks from the French Quarter, Jackson Square and Cafe du Monde (beignets! 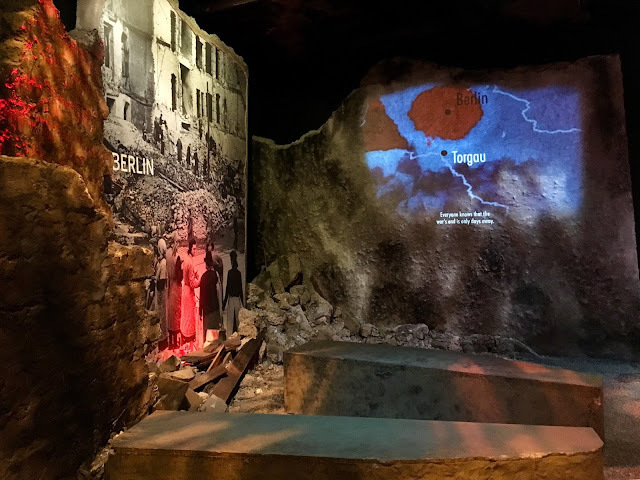 ), the World War II Museum, several streetcar lines for the times we wanted to go farther, and also a couple of car rental agencies for the day we took a one-hour drive to Baton Rouge. 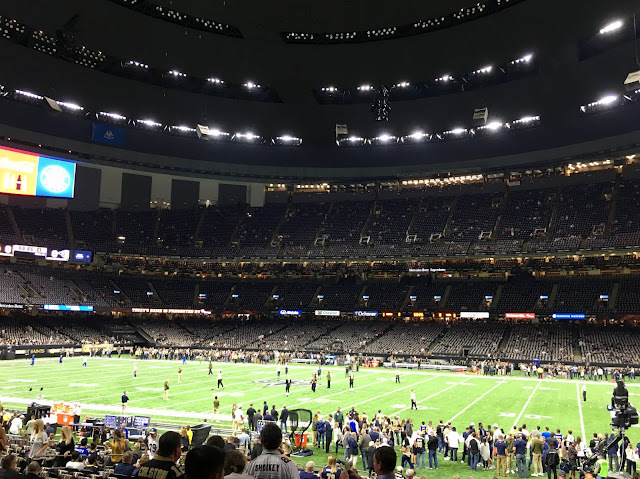 We were also within walking distance of the Mercedes-Benz Superdome and the Smoothie King Centre when we went to an NFL game (Rams vs Saints) and an NBA game (Bulls vs Pelicans). And, we also walked to the historic Saenger Theatre one night to take in a Simple Minds concert. Reception desk at the Eliza Jane hotel in New Orleans. A standard room. The movable, open "closet" at left even has shelving that fits two carry-ons ... genius! Part of the open courtyard for relaxing. Another area has tables for outdoor dining. The exposed brickwork is everywhere. 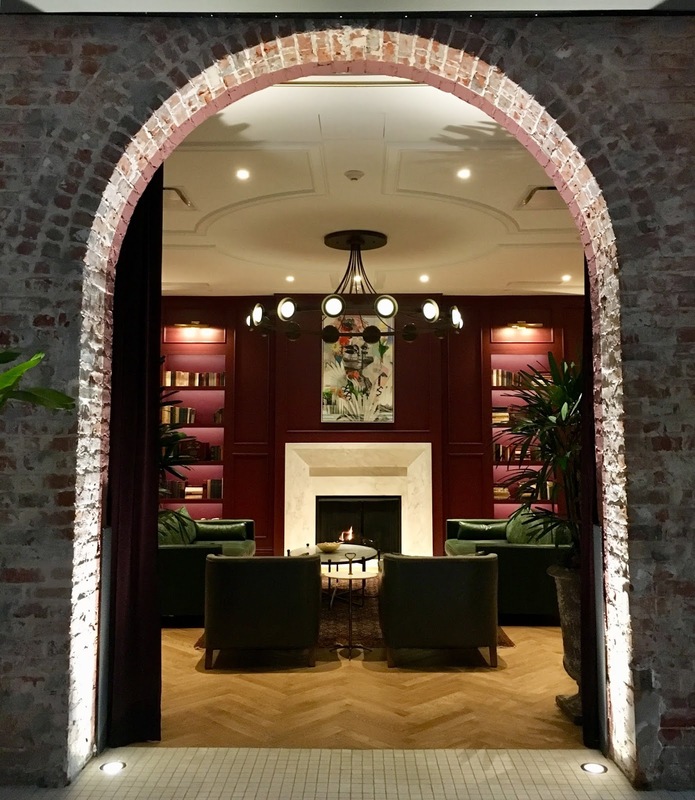 Eliza Jane hotel's library lounge. 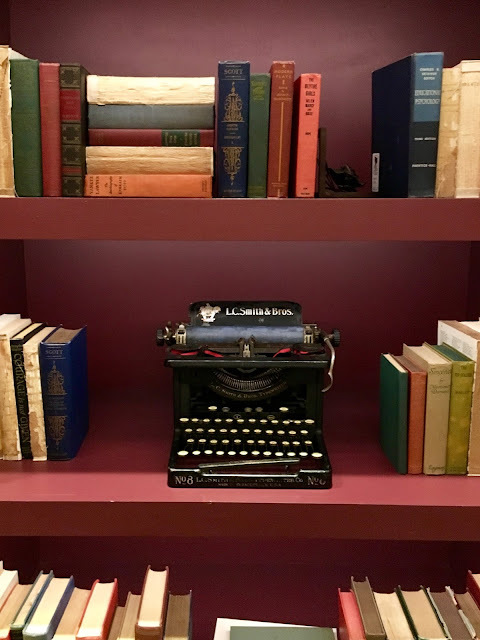 There are books everywhere through the hotel, including the rooms. Sitting area by concierge desk, with meeting table behind, and the hotel bar behind that. Clever "do not disturb" door hanger pays homage to the building's newspaper history. Part of the decor in the library lounge, another nod to the building's history. Where to eat in New Orleans? 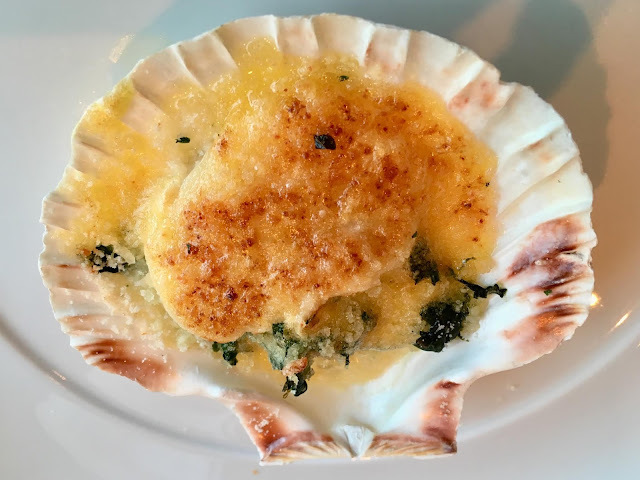 Here are my top restaurants picks. New Orleans has many highlights: Great music, night life, history, architecture ... The Big Easy is a town made for tourists. But one of this city's most famous attractions is its great food and drink. 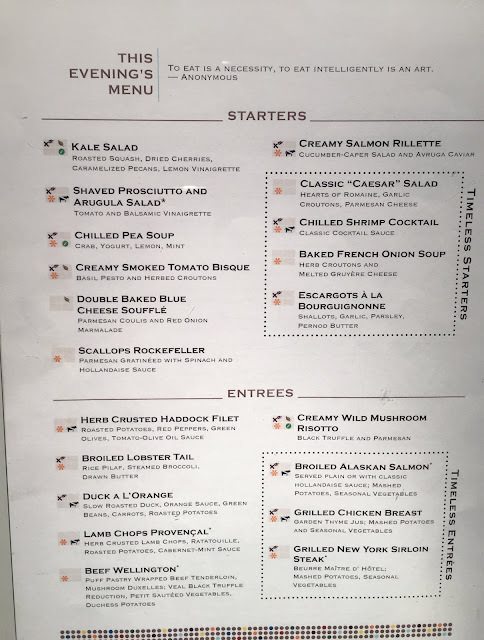 The best part is, you don't have to break the bank to eat really well here, and this is actually one of the few cities where you can be in a touristy area and the food is fantastic anyway. Unfortunately, I've been to too many places where you have to walk at least five or six blocks from a tourist attraction to get decent food. 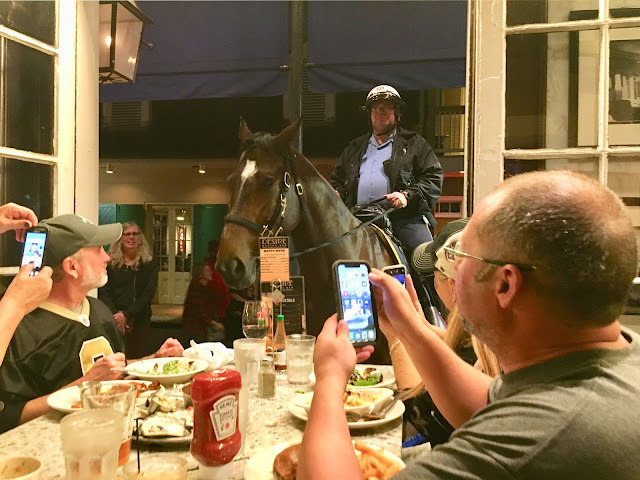 My only caveat: I would choose wisely when eating in the heart of the French Quarter. I had some disappointing meals here. If you're visiting NOLA, here's where you should eat. This breakfast spot is SO GOOD it's hard to believe it's a chain. There are six locations in New Orleans, and some are busier than others. The restaurant closest to our hotel was in the Central Business District and lineups here were always around 30-40 minutes. 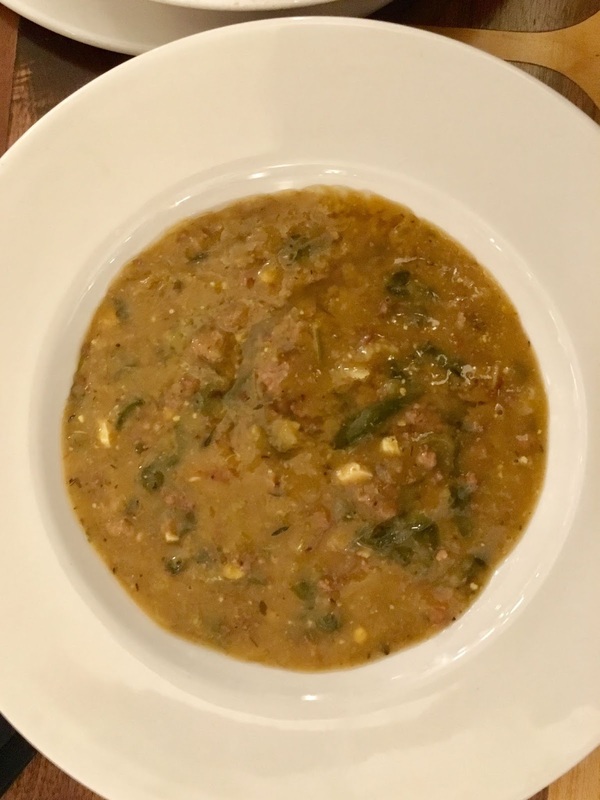 (Hours at the CBD restaurant are from 7 a.m. to 2 p.m.) But the restaurant on Decatur Street is only a few blocks away, and it's often way less busy. Recommendations: Get the Peacemaker, which comprises your choice of two signature bennies. And order a side of the roasted potatoes. The Peacemaker: Chicken St. Charles benny (left) and corned beef benny, with a side of potatoes. 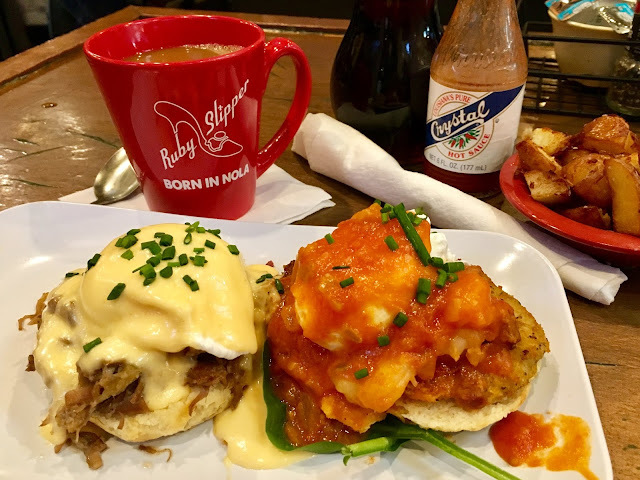 The Peacemaker: Eggs Cochon benny (apple-braised pork) on left and Shrimp Boogaloo (Gulf shrimp in Creole sauce). 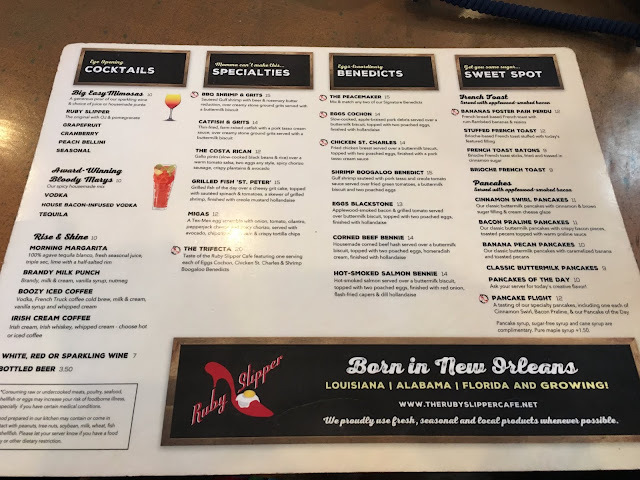 The Ruby Slipper Cafe menu. 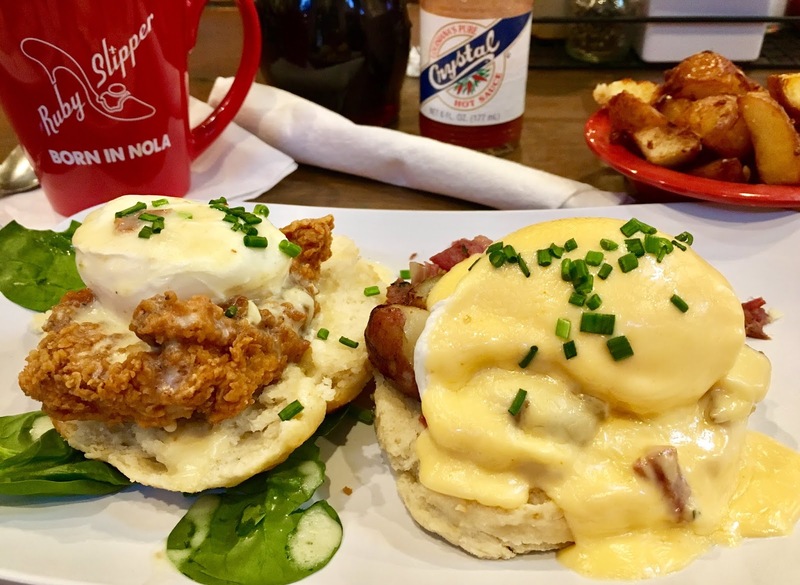 If you're in New Orleans on a weekend, you have to do a jazz brunch or breakfast. That's where musicians walk around the restaurant and perform while you're dining, and it's a real thing here. The musicians will even take requests; just make sure you tip them afterwards. 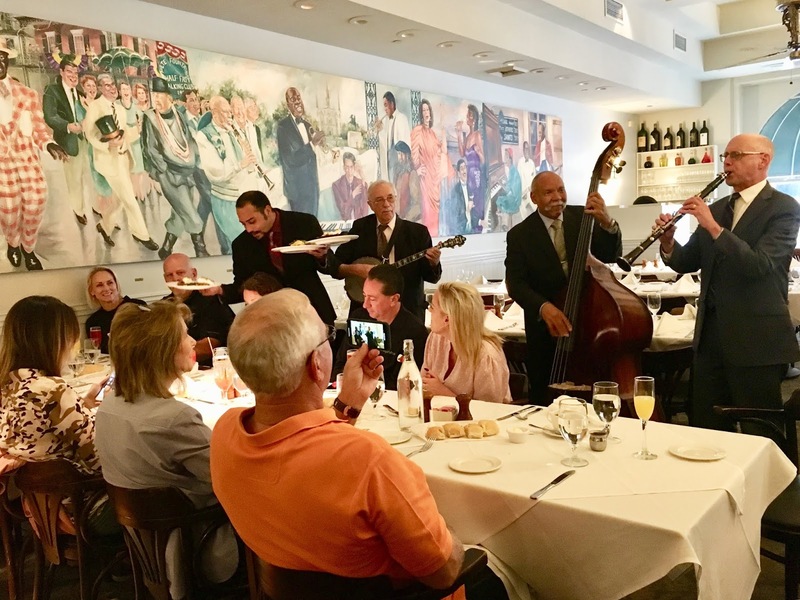 The Palace Cafe has a great jazz breakfast tradition and I was really happy I was able to experience it. Seats are in short supply here because customers can order a la carte, which makes for a cheaper meal than at a jazz buffet, so make sure you reserve your table. But if you aren't able to reserve in advance because your plans haven't been finalized, the elegant bar has first-come, first-served table seating. Bonus marks to this restaurant for not being snooty despite the white tablecloths. Recommendations: Have the turtle soup, finished with sherry, as well as the Bananas Foster. Also the gumbo. These three dishes are a must. Jazz breakfast at the Palace Cafe. Palace Cafe's amazing turtle soup, finished with sherry. 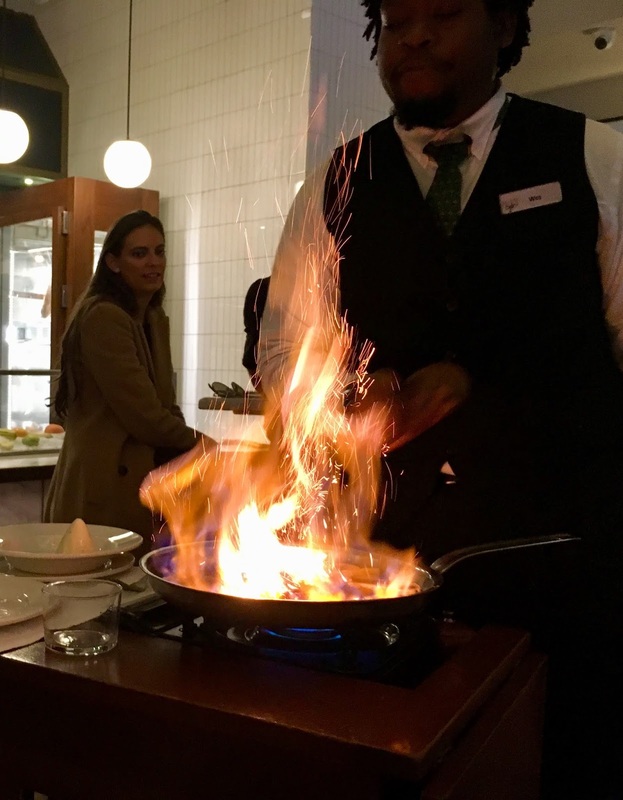 The Bananas Foster is created at your table and it's a real production. Have your cameras ready. 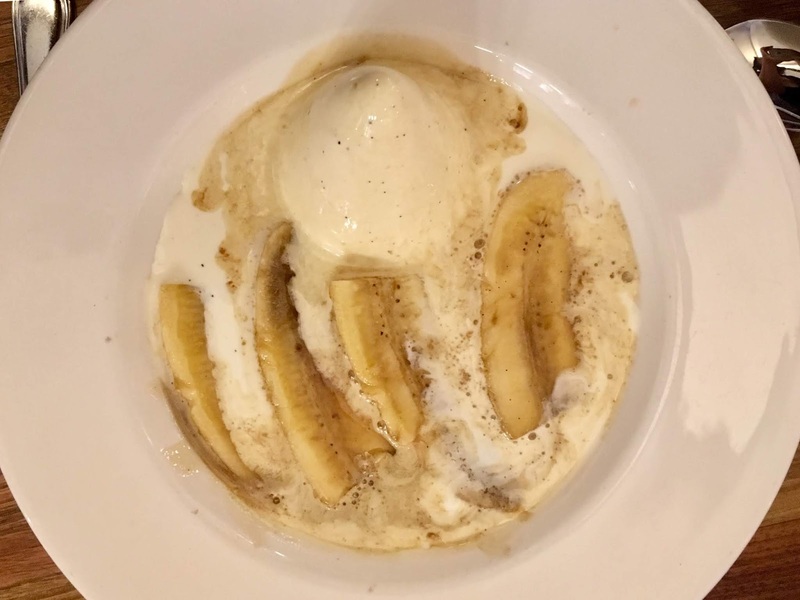 Bananas Foster at the Palace Cafe. Arguably the most famous culinary "must" in New Orleans, the Cafe du Monde beignet is also probably the cheapest. 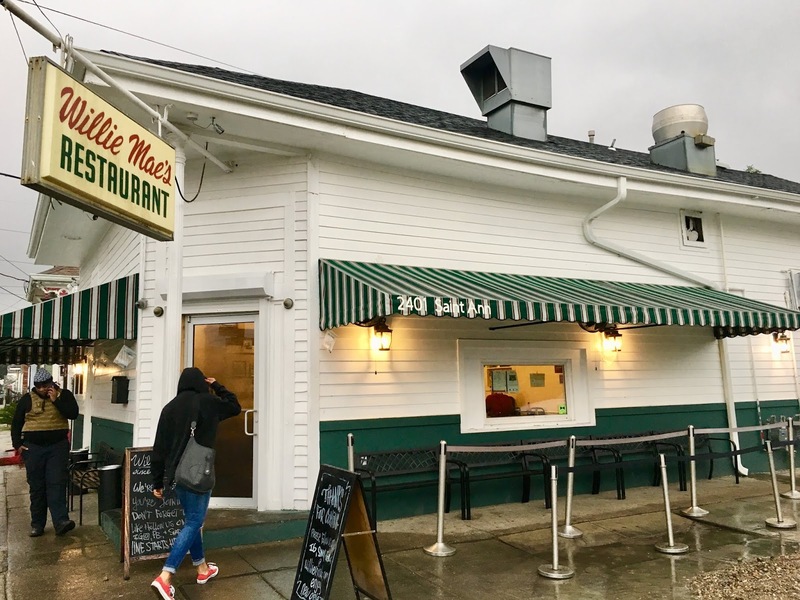 You know a restaurant is good when it only serves one item, and has been around for more than 150 years. Beignets are so light, yet have such substance, they're really in a separate class of pastry. 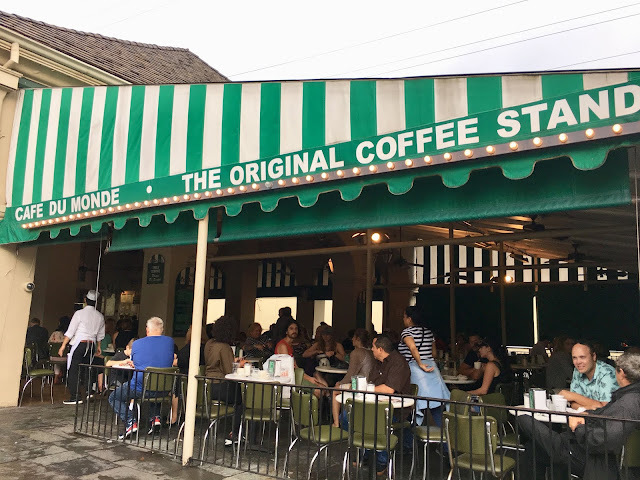 Cafe du Monde has eight locations; the French Market restaurant is the original and coolest. This location is open 24 hours/day, closed only on Christmas Day, and it takes cash only. Cafe du Monde's French Market restaurant. Out of all of our meals in NOLA, my husband and I enjoyed our supper at the elegant Commander's Palace the most. This jewel in the Brennan family's restaurant empire really is all that. Just a note of caution: This place is very swish, so do dress up. We had dressed smart casual but once we arrived and saw the restaurant and its diners, we wished we'd upped our game a bit more. Also, make reservations; it does fill up. Next time we're in New Orleans, we'll try to have lunch here so we can have a few of their famous 25-cent martinis. 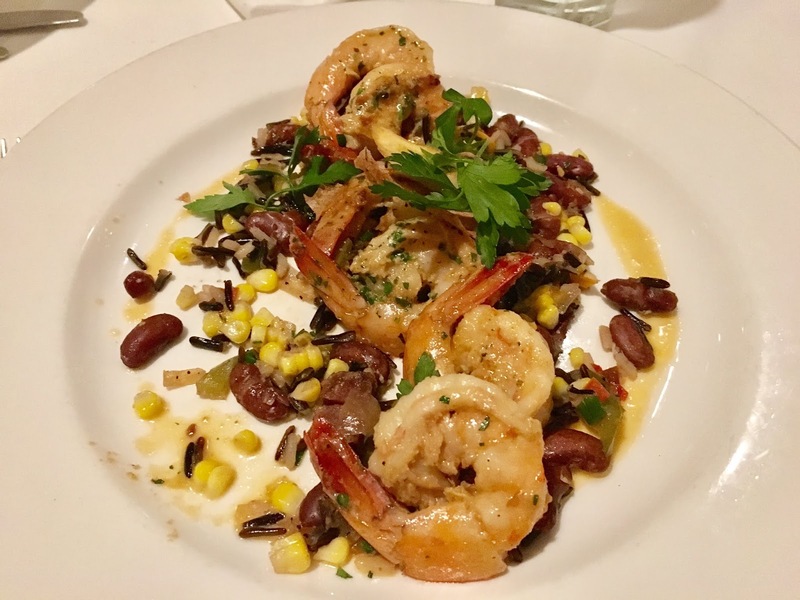 If you're staying in the Central Business District, just hop on the St. Charles streetcar and it will take you to within a block of this Garden District restaurant. Recommendations: The three-course prix fixe menu is your best value here. I had the turtle soup, Louisiana wild white shrimp and the Creole bread pudding souffle. My husband ordered a la carte, and had the gumbo and the brown butter seared diver scallops. Everything was delicious! Louisiana wild white shrimp at Commander's Palace. 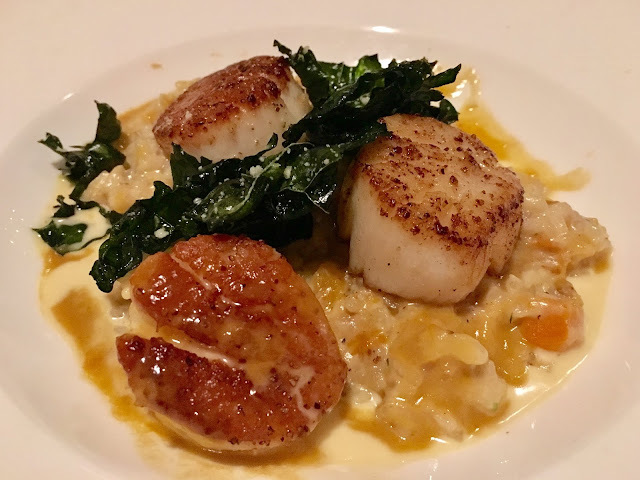 Brown butter seared diver scallops, served over risotto and crispy kale, at Commander's Palace. Creole bread pudding souffle. The waiter poked a hole in the souffle, then spooned a whiskey cream sauce into the centre. 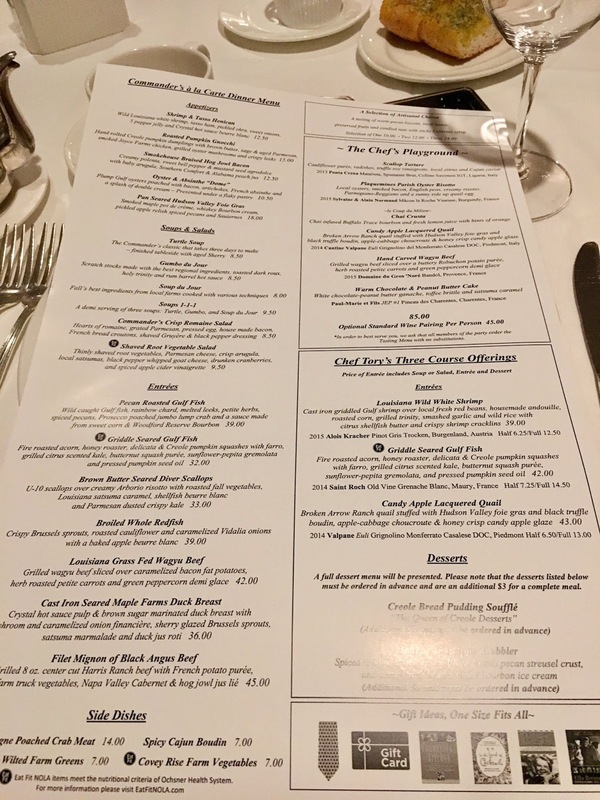 The menu at Commander's Palace. 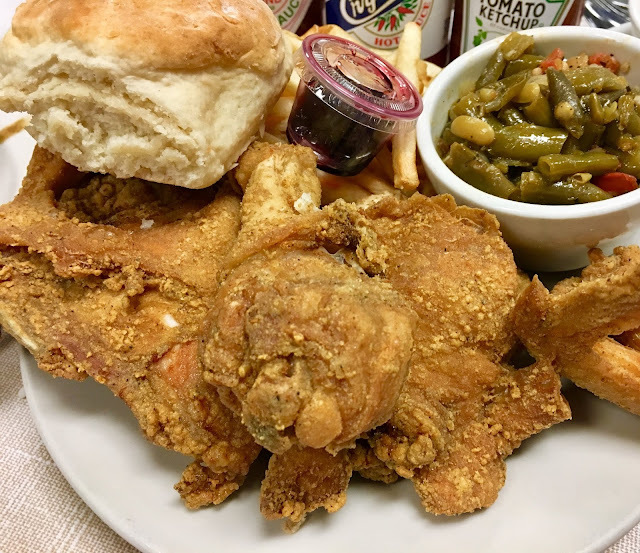 If you think a place called Mother's Restaurant serves down-home, delicious food in a humble setting ... well, you'll have nailed it exactly. This little restaurant in the Central Business District has just a handful of tables, and customers are handed a menu as they enter. After customers have made a decision (while standing in the centre of the restaurant), they order at the till, pay and then look for a table. Hopefully, there is a table to be had! 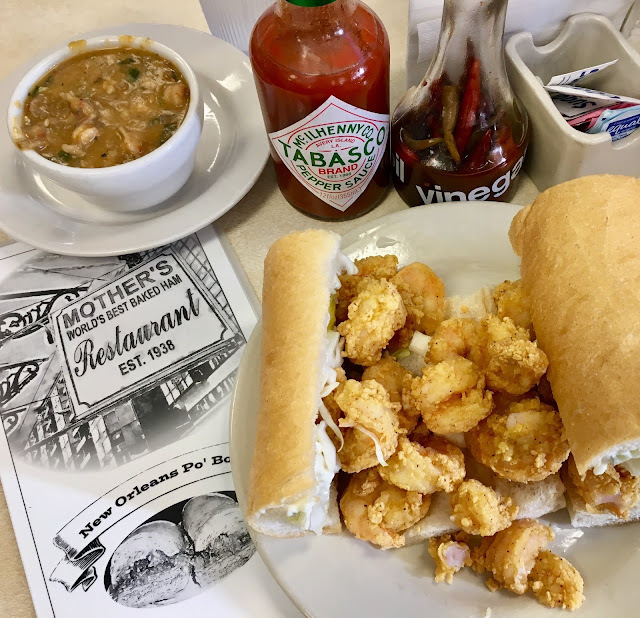 Shrimp po-boy, served with a bowl of crawfish etouffee, at Mother's Restaurant. 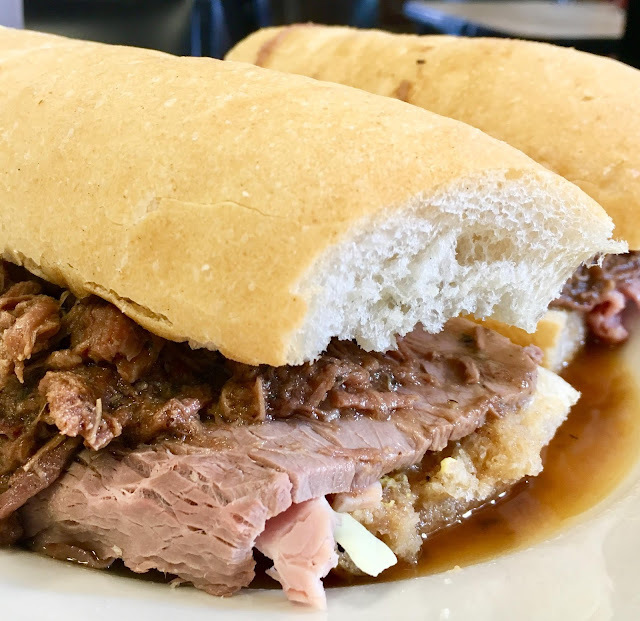 The Ferdi, a ham and roast beef po-boy. Mother's fried chicken, served with green beans and a container of blackberry jelly. Don't be fooled by the low-brow dining room at Mother's ... there's some amazing food being created here. 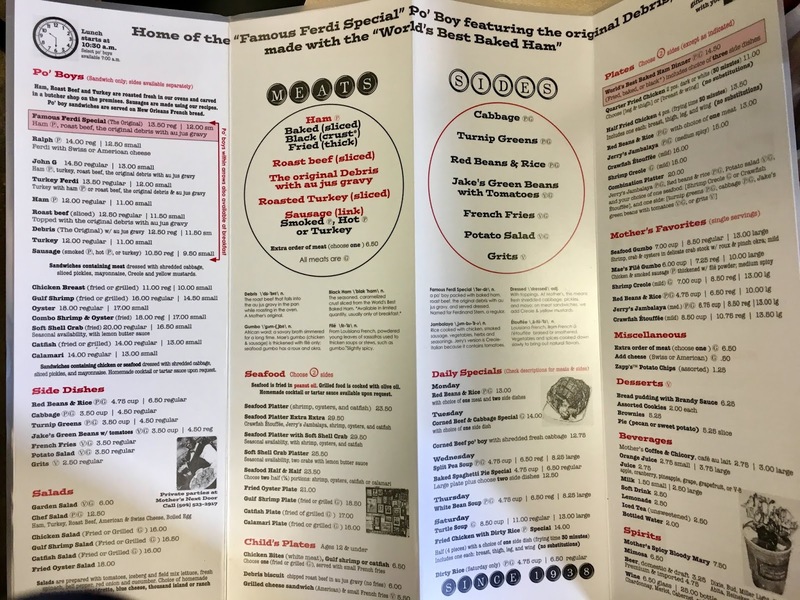 The menu at Mother's Restaurant. 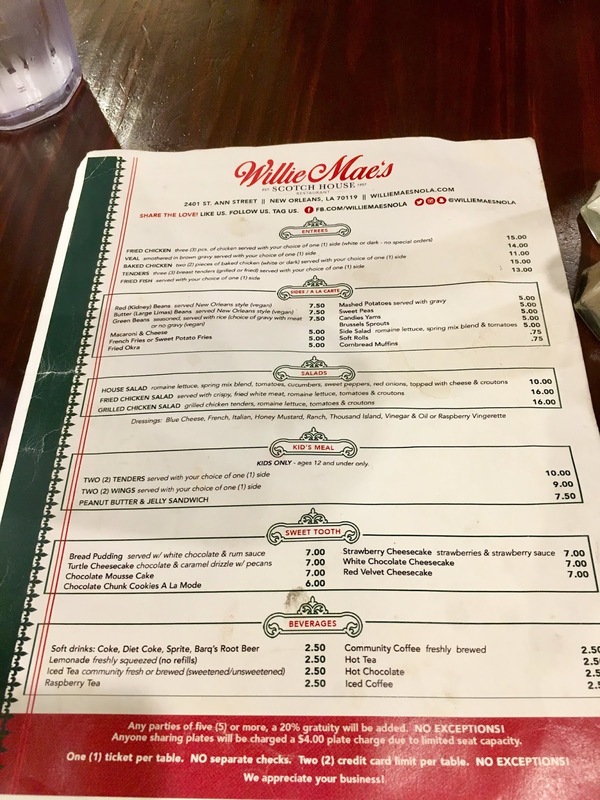 It takes a bit of effort to get to Willie Mae's Scotch House in the Treme neighbourhood, but it's well worth the $15 or so Uber ride to and from the French Quarter. We thought the chicken pieces were on the small side for the price, but the batter was to die for and the chicken was very moist and tasty. No wonder it's been named "America's Best Fried Chicken" by the Food Network and Travel Channel, among numerous other accolades. Even the locals, including our Uber drivers, rave about Willie Mae's. Recommendation: Have the fried chicken, of course, but make sure you order the fried okra as your side. 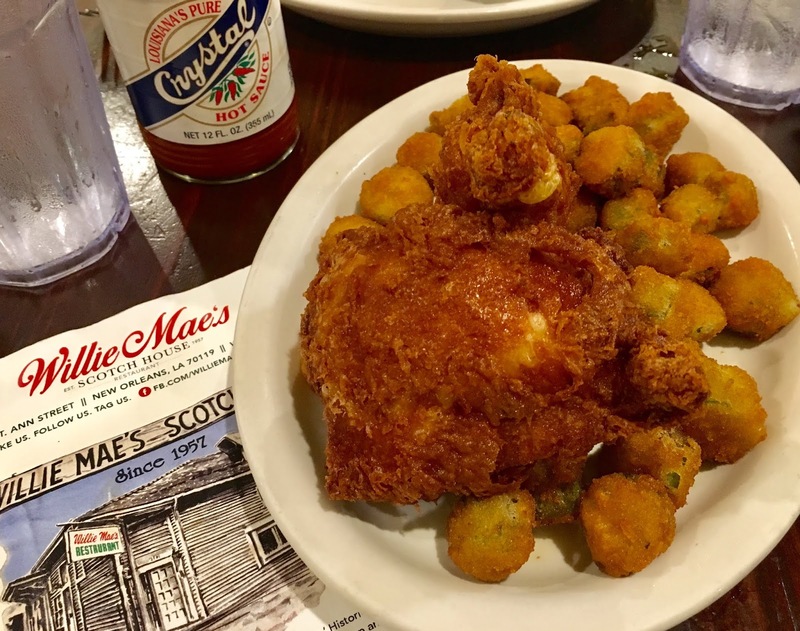 Fried chicken with fried okra at Willie Mae's Scotch House. Willie Mae's Scotch House in New Orleans' Treme neighbourhood. The menu at Willie Mae's Scotch House. Roux 61 is not in New Orleans but I wanted to include this restaurant in case you're thinking of visiting Baton Rouge, Louisiana's capital, just a one-hour or so drive from New Orleans. 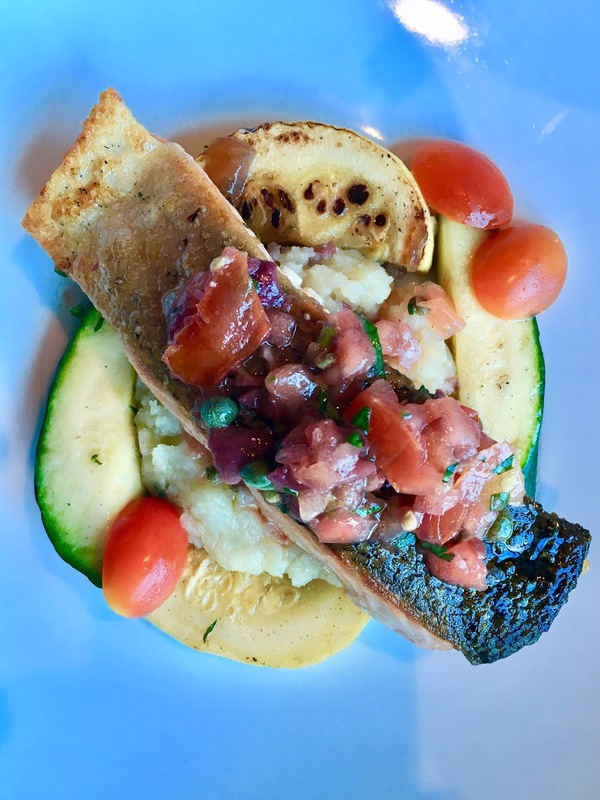 Roux 61's dining room is casual, the prices are mid-range, and the food is fantastic. 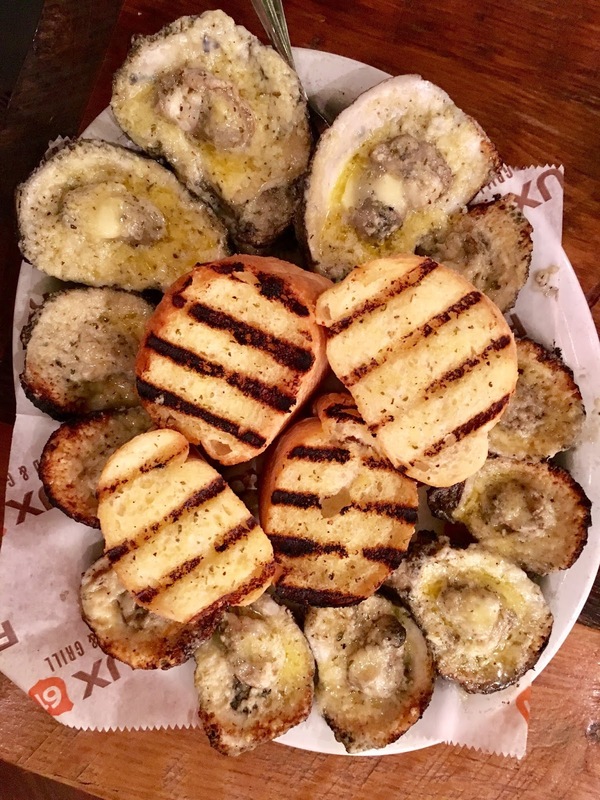 Recommendations: Have the soft-shelled crab, the seafood-stuffed baked potato and the char-grilled oysters. Incredible! 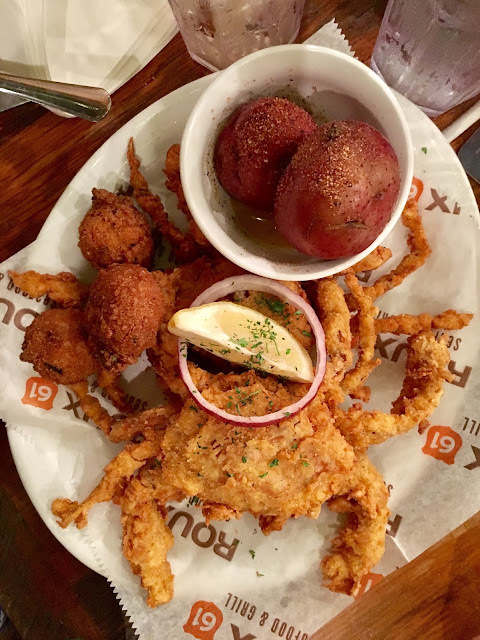 Soft-shell crab served with hush puppies and Cajun-boiled potatoes, from Roux 61. 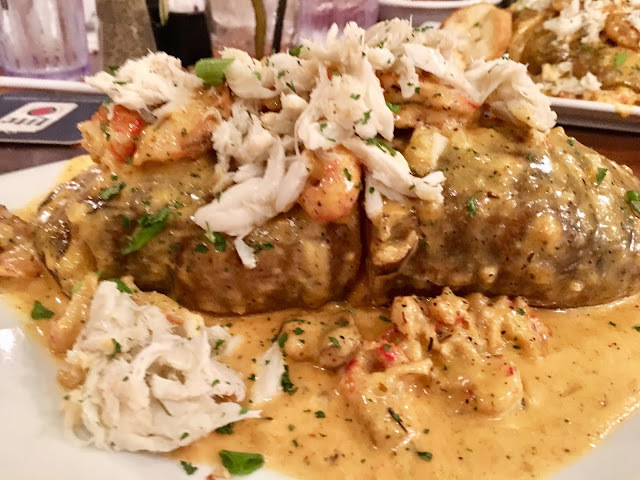 Shrimp, oysters, crab and crawfish topped with a white wine lobster cream sauce, served on a baked potato. Char-grilled oysters at Roux 61.